Leave London behind and cycle your way through the Surrey and Sussex countryside before reaching Brighton seafront. 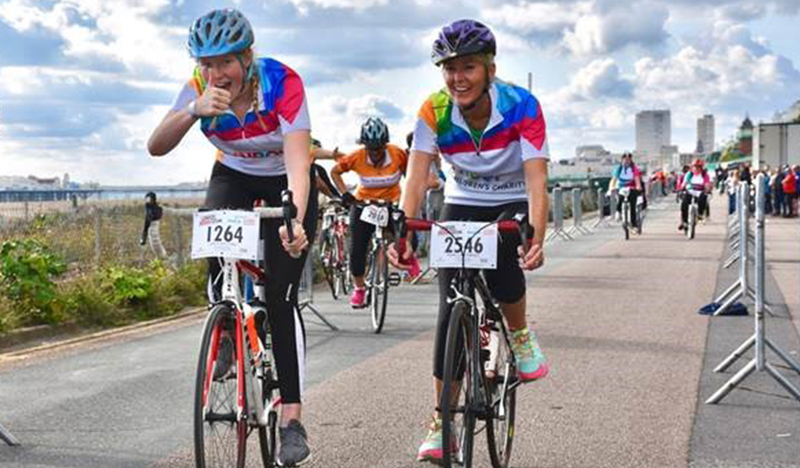 This 55 mile iconic cycle route can be achieved by newbies and experienced riders alike, complete the challenge at your own pace all whilst raising money for families caring for a seriously ill child. We had the most amazing experience and would thoroughly recommend the London to Brighton cycle to anyone. The camaraderie on the day was fantastic, arriving on the seafront to all those smiling faces was a wonderful feeling- we had a very special day. Rainbow Trust does such extraordinary work with children and their families who are suffering that it was easy for us to want to raise money for them. We would do it all again in a heartbeat. Broni and Graci, 2017 cyclists. Fundraising materials to help you hit your fundraising target. The event is organised by Skyline Events for any extra information regarding the ride and what’s included please visit their website. For further details about joining Team Rainbow Trust or to tell us about your own place, please contact the Sports Team directly on 01372 220031.